Posture Grids will be shipped in 3-5 days. This 36” x 84” Posture Grid is printed on a special lightweight durable/flexible vinyl with Grommets already inserted and is easy to hang. The grid is comprised of eight major horizontal lines and one vertical line that are surrounded by two inch squares. 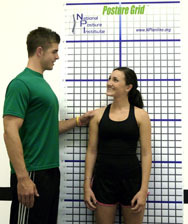 This grid was specially designed to provide rapid visual cues of an individual’s posture to aid in correcting postural deviations and educating clients and/or patients on proper posture. This grid is great as a stand-alone posture education tool. It requires no floor space for set up, so it can fit into almost any assessment room. 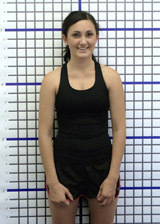 It's also fantastic to use with our National Posture Institute Posture Pro software. This grid also comes with an online Instructional video (75 mins/filmed in HD), and 4 Downloadable Assessment Documents included with purchase!